I really like this seating arrangement…it’s unexpected (translation: memorable), and it feels very welcoming to see the settee beckoning from the corner, don’t you think? In this post, I’m discussing further thoughts on the furniture placement in my designer house sunroom. Once I decided to focus my seating area to the right of the room, and orient my rug straight out from the kitchen steps, I thought about how to place the other furnishings I’d like to include. My first thought was to orient the tufted settee, so that those seated could enjoy views of the garden. 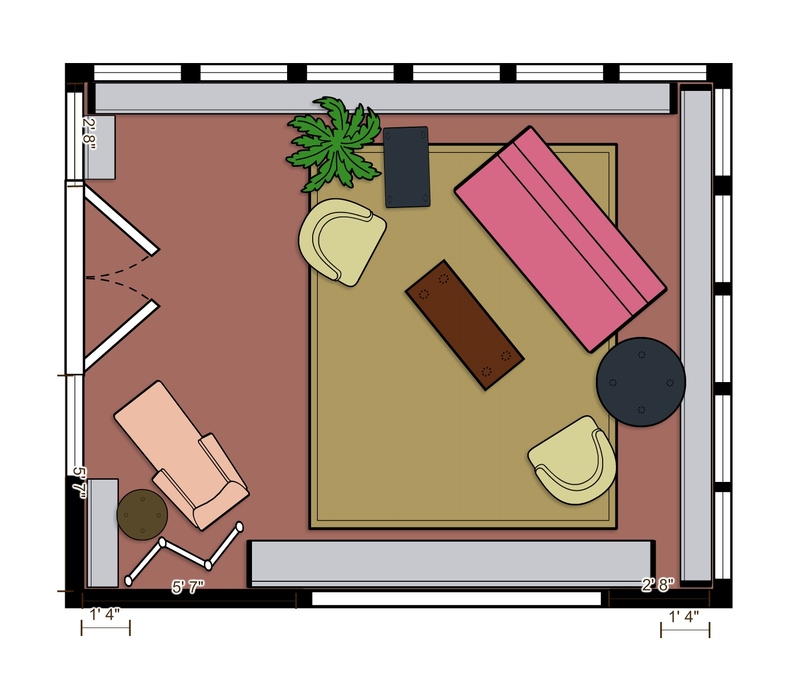 But this means visitors will have to squeeze by at the left (between the rattan chair and Duchesse Brisee) to exit the space through the French Doors, and might create an uncomfortable bottle-neck situation when there are multiple people viewing the room.. 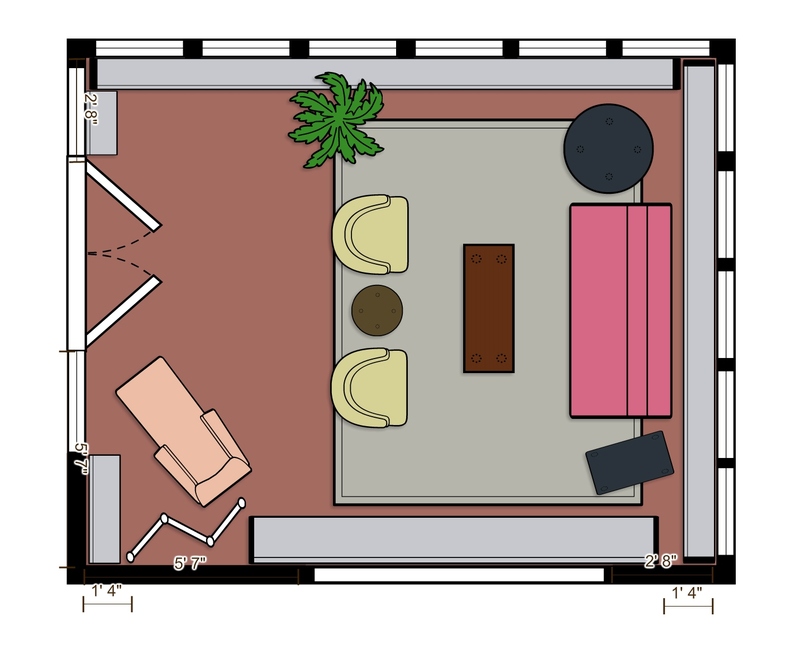 So I turned my thoughts to opening up the center of the room, and doing something more interesting and unique with the floorplan. Why not try a diagonal placement, I asked myself? This would allow those seated to still enjoy views to the outside, while making the traffic flow to those French doors still accessible. It will also make the brightly upholstered settee one of the first things visitors see when approaching my space, while not placing the settee’s back to the lovely view entirely. Turning the main furniture grouping on the diagonal allows the center of the room to feel more open, and the settee to welcome visitors into the space. The Duchesse Brisee is placed in its own corner, for optimal viewing of the pond outside. I really like this seating arrangement (translation: memorable)…it’s unexpected, and it feels very welcoming to see the settee beckoning from the corner, don’t you think? Unfortunately, after scrubbing the tile on hands and knees (much thanks to my wonderful husband for accompanying me and participating in this futile effort!) and using many kinds of cleaners (both non-toxic and toxic), the residue on the terra-cotta tiles would not come up. The dark stains are embedded down into the terra-cotta. So it looks like I have to rethink my rug placement and cover up the previous owner’s floor discoloration. 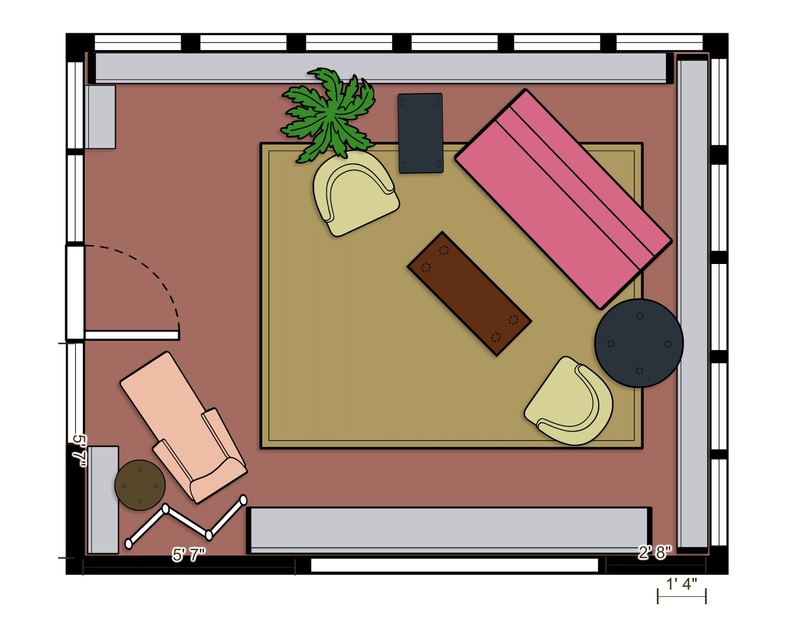 Oh well….everything I’m planning will still work well in the space. The furniture looks great on the diagonal, and the rug still looks good placed sideways to cover the discoloration of the tiles. Sometimes I just have to go with the flow! This entry was posted in Designer House, Furniture, Home Decor, Interior Design, Sunroom, Uncategorized and tagged Bucks County Designer House, Chairs, Decor, Decorate, Decorating, Design, Desk, Duchesse Brisee, Flokati, Interiors, rugs, Settee, Victorian, Windows. Bookmark the permalink. I AM thinking of adding some upholstered stools in front of the table, Sheila. Good call! I want to wait and see how the spacing feels first, though. Since traffic flow is through the left corner, I need to make absolutely sure there is plenty of room for people….the designer house can get quite crowded, as you know! Thanks for commenting! would you mind if I tweet this post? Please feel free to tweet and share! Thanks for visiting Kristine Robinson’s Blog.